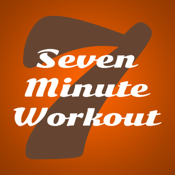 The Seven Minute Workout Timer is the most convenient way to follow the "Scientific Seven Minute Workout!" With this exercise routine, in 7 minutes, you will complete 12 exercises for 30 seconds each. There is 10 seconds of rest between each exercise. The Seven Minute Workout was scientifically created to be more effficient than other wokout routines and is detailed in the May/June 2013 edition of the ACSM's Health and Fitness Journal. This scientific seven minute workout has been recently featured by major television, print, and online media. Use this timer to time and track your workouts today! * Large text tells you the current exercise and time from across the room. * Photos demonstrate each exercise. * Audio cues tell you when the next exercise segment is starting. * Vibration enabled for quiet workouts.